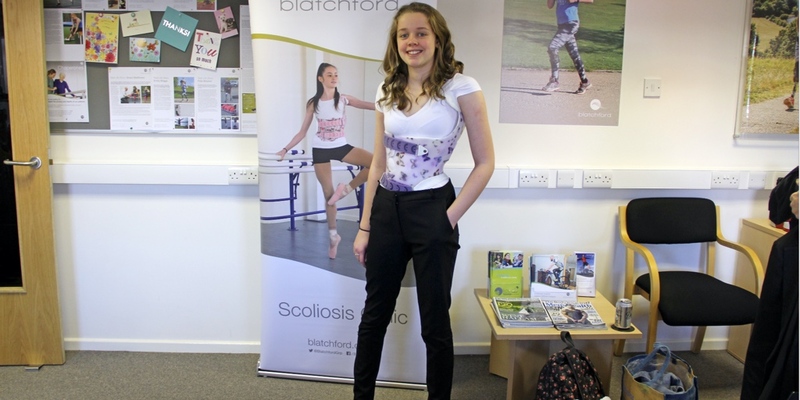 My mum realised that I had a scoliosis when I was 10, from then on my life changed. We first went to the local GP who referred me to the Sheffield Children’s Hospital (my mum’s choice) where I had an x-ray showing that I had a scoliosis at about 35°. I was offered a brace (Spinecor). At my choice, I accepted the offer and then was thrust into a dynamic brace for 22 ish hours a day. The comfort of the brace was a big factor on why I was upset with the brace. The more my scoliosis increased, the more it rubbed me around my legs and hip. Even today I still have the scars (battle scars!). More x-rays showed my scoliosis at 50°, so the Spinecor brace wasn’t working. So, like my mum always does, she researched everything ranging from Boston braces to surgery. Following a conversation with Steve, the Orthotist, and further research, we found the Gensingen Brace. I came to an open day at Blatchford and had a trial orthotics appointment and some physio. I decided to get the new brace after one and a half years of wearing the Spinecor. When I first put on the brace I was upset and thought that my life was over, but I soon found out that it wasn’t. My mum thought that I wouldn’t be able to sleep in it or last a full day initially, but here I am; I’ve worn it for ten months now. I’ve had my fair share of being ridiculed for being different, but trust me, it’s going to be ok. Wearing a fixed brace is very different to wearing a dynamic one. It makes going to the loo easier, although you may not think it, but it’s comfier and makes me more independent. I can put it on and off by myself. I will have to carry on waiting and wearing the brace to see what happens, and see if it works.